FROM THE PIE KING HIMSELF! Can we all just take a minute and really look at these pies? They could easily be mistaken for the scented fake ones that you find for the holidays in order to make your kitchen smell delicious; however, this is the real deal. I am proud to say that I know the fine baker that made these beauties, and also privileged to say I get to eat these twice a year. I consider my stepdad, Dave, the “Pie King.” This nickname did not come right away, you see. I need to backtrack and little and explain that he is just a good cook in general. He especially shines when Thanksgiving rolls around each year, he truly makes an amazing meal. He literally cooks everything from scratch and we are continually impressed each year. Because I have always been more of a “foodie,” meaning I choose to stuff myself with food instead of “saving room for dessert,” I didn’t always make dessert or the pies, a priority. Therefore, I always admired him for his fine cooking skills. 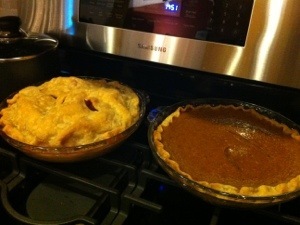 Then it dawned on me, my stepdad is amazing at making pies, too! All of this time I had let his turkey, cranberry sauce, stuffing talents take the front seat when in all reality, the pies were the prize! That incredible pie that I had eyed up and down throughout the previous years was calling my name. But not just the pumpkin pie, the apple pie as well. I didn’t know how to handle this situation so the obvious thing to do was just to eat a slice of each! And that, ladies and gentlemen, is my Thanksgiving tradition. Saving room for two slices of pie from the Pie King himself! There is a new spot in town! Well, new to me. I go through Living Social/Groupon phases; meaning, sometimes I think everything looks like a great deal and I can’t wait to try 5789 new restaurants, and sometimes I can’t seem to find anything appealing. 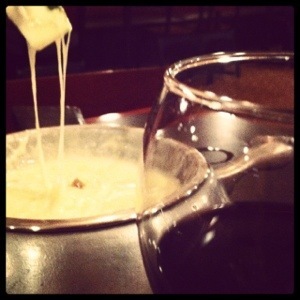 Well one of the best deals I have experienced was when Danny and I went to That Fondue Place in Edgewater, NJ. It wasn’t a typical set up of what one would think when going out for fondue. There are not many fondue restaurants in our area but the couple of places we have gone, it is a darker, intimate setting and on the fancier side. Right away, there was something different about “That Fondue Place.” We were greeted right away into a large room filled with tables and bright lighting. 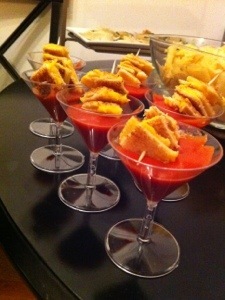 The servers acted as hostesses as well but you would not notice a lack in service. Our groupon allowed us one appetizer option, one entree and one dessert. Definitely remember to bring your wine or beverage of choice because it is BYOB. You end the meal with an amazing dessert fondue. This was by far the hardest decision because there were so many options that would probably have been equally as satisfying! Hands down, they have something for everyone. Campfire (marshmallows, graham crackers and melted chocolate), Cookies n Cream, Chocolate Knockout, Chocolate Cheesecake, seriously? Next time I want to just go for dessert! The aftermath of Hurricane Sandy was incredible. It was amazing and shocking to hear how many people’s lives had been affected by the storm, not only losing power, but losing pets, cars, homes, memories and so much more. I was so proud of my network of friends who had volunteered to help in a myriad of different ways. Those who lived close to the Jersey shore actually lent a hand by going to the boardwalks and cleaning up, or helping clean out homes that were destroyed by Sandy’s winds and high waters. Some volunteered to sort out all of the clothing that had been donating. The piles and piles of clothing were overwhelming. Some who didn’t live as close, contributed by creating fundraisers and concerts to raise money. So many of these same friends were victims themselves, so it really shows the power of community and coming together to grow stronger. The company I work for offered a couple of different volunteer programs to help out during this tough time. 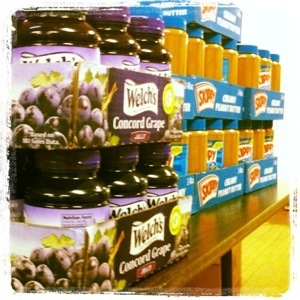 One of the opportunities was to make sandwiches for the emergency shelters in the Long Island/NYC/Staten Island area. I went with one of my good friends from work and it was really such a great experience to help out and also to meet so many other people who wanted to come together to reach a common goal. After tragedies such as Sandy, there really is a greater sense of community and coming together that is a great feeling to be a part of. Now since this is a food blog, I do need to contribute this great piece of advise that I learned while making the pb&j sandwiches! If you coat both slices of bread with the peanut butter, then put the jelly inside, it prevents the sandwich from getting soggy! Mind Blown! Talk about the perfect step out of my normal restaurant routine. I feel like even as a foodie, I am attracted to the same type of restaurants time and time again. 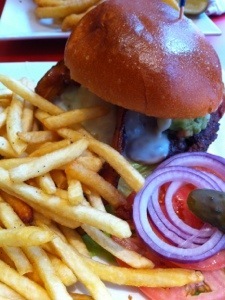 Sushi, Burgers, Seafood, Wine Bars, etc. etc. Casona is quite the experience for several reasons. Danny and I went down to my parents in South Jersey earlier this spring to celebrate my mom’s birthday. It was a beautiful day and we were looking forward to a nice lunch and then heading over the bridge to Philadelphia to see the Seaport Museum. We had talked about going to Collingswood for a while but just had not gotten around to it. Collingswood is a cute town with a lot of shops and restaurants on the main strip, and really perfect to walk around when the weather is nice. After looking at our options, we came along this homey, Latin/Cuban restaurant that we all agreed sounded perfect. We were all impressed with the variety of the menu. Everything from sandwiches, soups, salads, you name it. 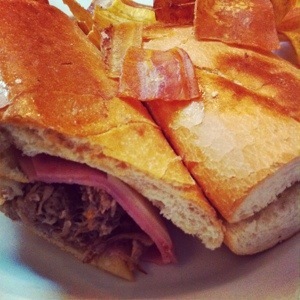 I could not help but order the Cuban sandwich. The pork is roasted in a citrus marinade, ham, swiss cheese and garlic mayonnaise. Cooked to perfection! There was a cute shower going on in the back on the patio while we were there and it looked like a lot of fun. They definitely have a great atmosphere, something a little different than South Jersey is used to and we will definitely be back in the near future. Congratulations, Casona, for your recognition as BEST BYOB restaurant on the Philly Hot List this past week! Way to go! Casona, the Large House of Latin Flavors in Collingswood! I have a thing for Taco Bell. Not many people do, or at least not many people are willing to admit it, but I do. In high school, my sister Christy and my friend Mattie and I used to hop in my ’96 Jeep Grand Cherokee after school and go to the nearest Taco Bell for a Cheesy Gordita Crunch. Oh but wait, my love started before then! This is actually terrible but my elementary school in Charlotte served Taco Bell on Tuesdays for a year and I would bring my $.80 for a chilito whenever I was allowed. Wow! Probably a good thing they didn’t keep Taco Bell Tuesdays for too long, otherwise I am not sure what kind of physical condition I may be in after weekly indulgences since age 8. Side note: I have to say that from an advertising point of view, they have had some genius campaigns over the years. “Yo Quiero Taco Bell,” anyone remember that? Or “Think Outside the Bun?” Hmm I’m pretty impressed. So, let’s get back on track. So over the past few years I would say I have kept my guilty drive through visits to a moderate level. Perhaps 3-5 times a year. But then something happened. 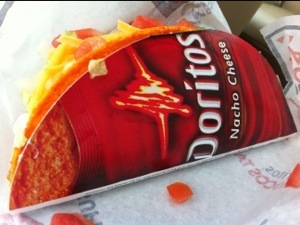 The Doritos Nacho Cheese Taco happened. Are you kidding?? 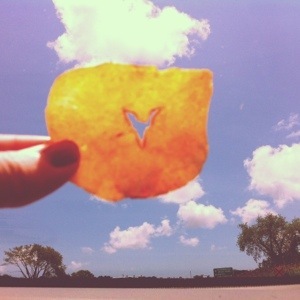 Did this just fall from heaven? And how did no one think of this before? The co-branding of Doritos and Taco Bell should have happened a long time ago. 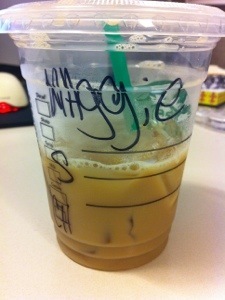 It happened for me on my way home from my friend Amy’s house one morning. Yes, morning. Not one of my proudest moments, but what can I say, those Taco Bells were ringing and I could not fight the resistance any longer. I made the batter and poured a spoonful into a separate bowl, this would later be the “sprinkle” pancake. Although Danny does love sweets, I didn’t want to overdo the birthday theme and have this taste more like a cake so early in the morning! I just mixed a few sprinkles into the pancake that ended up on top, added a spoonful of whipped cream, sprinkled some powdered sugar, and voila! I thought it came out pretty festive! 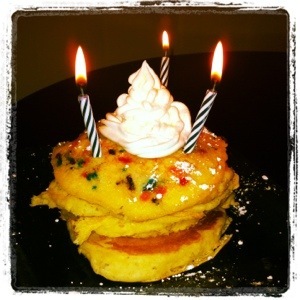 What are your ideas for birthday breakfasts? What did I do after my five minute photoshoot with this object I found so fascinating? Took a bite out of it of course!